FWIW it applies to everything, including the damage bonus (so includes spells cast against the target race). So this ability is extremely balance-breaking if exploited. Theoretically you could upgrade it to the defense boosting version instead of the dmg I did and make any ranger untouchable against creature types--including megabosses--as well (while basically having 100% crit rate). It didn't even require that much effort to get up the 50ish stacks I'm sitting at right now, with 8 bond and dual-wielding I get 6-8 per encounter, and I'm on Berath's so if you split up encounters outside of Berath's challenge you can do a lot per any small gathering of creature types (just split one at a time so you can build up a bunch of stacks). Wouldn't work so well with Woedica's challenge alas (at least without a cipher to help you regen resources). Edited by thelee, 24 March 2019 - 03:46 PM. Yes, it applies to every offensive action. You can also use blunderbusses or mortars + Driving Flight to stack more quickly. You only need one melee weapon to unlock the use. So, not sure I understand... First, what do you mean by Mortars? Also....so, the first melee hit determines the target race and then any hits by any means increase the stack? Do aoe spells work? Edited by DiabloStorm, 24 March 2019 - 06:50 PM. I tried this based on you saying something like this earlier, and I could not get this interaction to work. The ranged weapon is ignored for the full attack. You have to start the full attack from range and not from melee distance. Then the melee weapon gets ignored. With a blunderbuss you still get 8 stacks per shot which is better than 2 with melee. Ooor they patched it. Only hits with Hunter's Flaw add stacks, no spells. But yes, once you have stacks they will add +ACC (and the upgrade +dmg) to everything including spells. 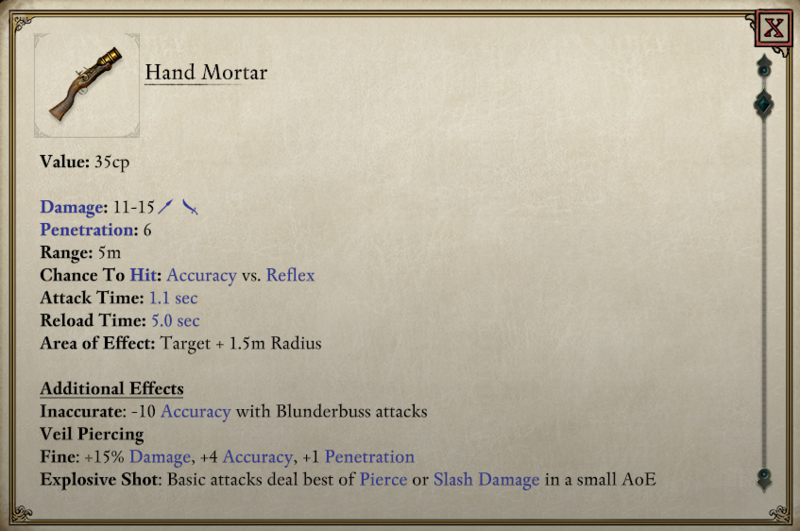 Of course Hand Mortars (Hand Mortar and Fire in the Hole). It may even be that Blinding Smoke counts as hit. Can't remember. Fire in the Hole has an additional jump that helps to generate more hits (=stacks) per shot. Other AoE ranged weapons are two handed except Minor Blights and Rot Skulls and thus won't work since you need(ed?) a melee weapon to trick the game since Hunter's Flaw is melee only. Edited by Boeroer, 24 March 2019 - 09:18 PM. With a blunderbuss you still get 8 stacks per shot which is better than 2 with melee. Ooor they patched it. But when I was using Hunter's Claw with dual-warhammers, I was getting: +1 accuracy per ability usage. can semi-verify: was able to attack at range with blunderbuss after boeroer's last post, and it only gives you one stack per weapon attack. you can verify this in combat log with multiple blunderbuss hits - your character sheet only gains one stack, and in the combat log each accuracy calculation uses the same amount of hunter's claw stacks, it doesn't increase throughout the attack. you definitely can get up to two if you connect two separate attacks via dual-wielding. Edited by thelee, 25 March 2019 - 03:17 AM. A shame. Well or not. I reported this some time ago and it seems it got patched. Not that you can use it with ranged weapons, but the multiple stacks per ability use (dpending on number of attack rolls per ability use). You could also get 2 stacks from Sun & Moon and multiple ones with Keeper of the Flame. That's also not working anymore I presume? Edited by Boeroer, 25 March 2019 - 03:24 AM.